Wow, we are puppy free for the first time in nearly 4 months. The house seems eerily quiet. Even with our own 8 and 3 foster dogs still in it. Without any foster puppies, the adult dogs don’t have anything to wind them up apparently. Except Maddie, the mother of the foster puppies that just left. The Yorkie foster puppies left Tuesday. At 11 weeks old, they were finally big enough for their spay/neuter surgeries, and so had that done yesterday. They’ll be staying at the shelter for a few days while they heal. And this weekend they’ll be off to their new families. But their mama, Maddie, is still with us for another week or so. And she’s not exactly happy about it. She saw us put the foster puppies into a crate early Tuesday morning, but she was okay with it, because I had done it a few times before. To take them to get their shots, and such. But when I returned home that day, after dropping them off, and carried that empty crate into the house, she kind of lost it. She searched that crate for them, she searched the house for them. She scratched at the door to go out, until I leashed her and took her out. She scratched at my truck until I opened it up. Then she searched it. She finally just laid down on my back seat. The dog seat cover, which by the way is one of my best dog related purchases lately, no more scrubbing puppy puke off of my back seat constantly, was still on it, and probably smelled a little like them. I carried her back in the house and cuddled her a bit. She got to sniffing my sweatshirt, which I had been wearing when I handled the foster puppies last. So I took it off and gave it to her. She slept on it all afternoon. Until Sister came home. Sister had held Maddie’s babies that morning too. Maddie got a little crazy again, and once again had to search the house and the yard this time. I had torn down the playpen, and reclaimed my dining room by then. All of the puppy blankets had been washed. The crate cleaned and carried out to the truck to be returned to the shelter. She was very insistent that she get to where we had been setting up the playpen when we took the puppies outside. She finally was ready to go back to the house. She immediately laid back down on my sweatshirt. She’s missing her babies. I feel bad for her. At least she got to stay with this litter for 11 weeks. Her former owner used to sell off her babies between 4-6 weeks old. And this will be her last litter. Next week she’ll be getting spayed, and will, hopefully, be off to her forever home. She is a sweet girl, only 5 years old, and already housebroken. So she should find her new home fast. I think there is even a few applications in for her already and she hasn’t even been listed on Petfinder yet. 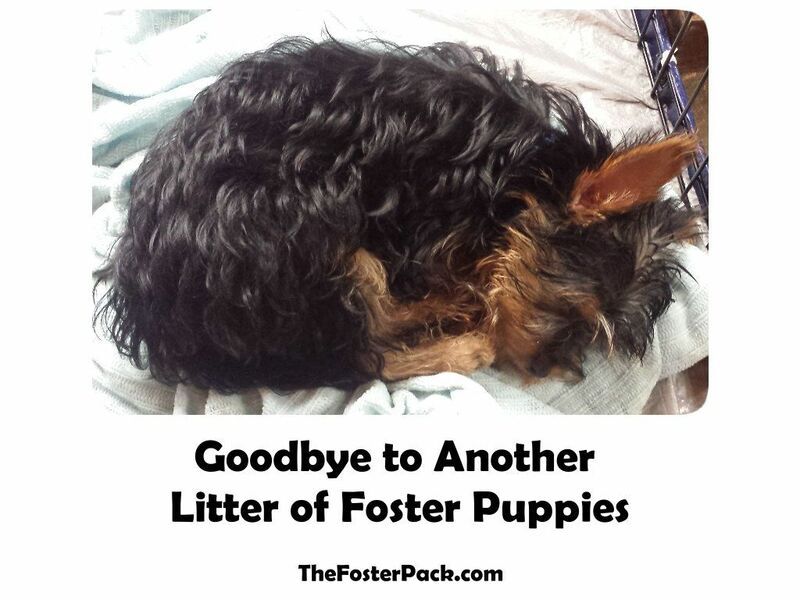 We’ll miss the foster puppies too. After nearly 4 months of puppies, 6 weeks of having two litters (1 full, 1 partial) the house will be quieter. And life will be calmer. Less barking, less cleaning, but also empty of tiny puppy growls. Sweet little foster puppy kisses, and those tiny little barks. At least until the next litter of foster puppies needs a place to crash. Hopefully not too soon. We do need a break. Foster puppies are a lot of work. But well worth doing. They made us laugh and smile on a daily basis for nearly four months. That itself is a great gift.